1. One of the most important places to visit while you tour the city is the Church of the Nativity - The Birth Place of our Lord Jesus Christ, to enter the church you need to go through the "Door of Humility, a small rectangular enterance to the church. The Nativity Church is also one of the most oldest surviving churches in the middle east. Bethlehem is one of the most important cities for Christians. Bethlehem means the "house of bread" in hebrew בית לחם. It is situated in the mountains at an elevation of approximately 800 meters above sea level and is 10 km south of Jerusalem. Today the city is administered by the Palestinian Authority, to enter the city you must go through an Israeli check point. 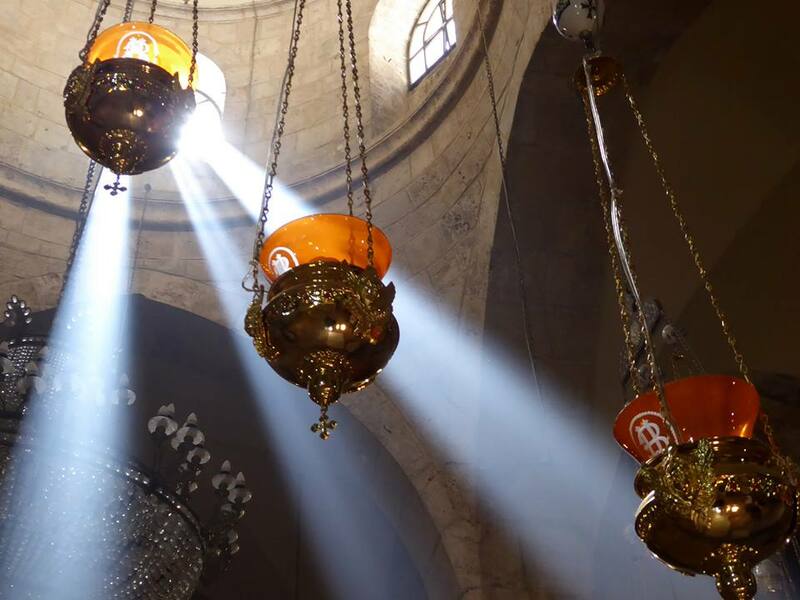 What to see at the Church of the Nativity? Also the Autumn great in (October, November and even in December) during Christmas season when temperatures are on average 15's-22's perfect for travel. 2. Church of the Milk Grotto known as the "Miracle Babies". This church is located in Bethlehem just a few meters from the Nativity Church. Tradition says that our Mother Mary gave milk to infant Jesus and few drops of her milk fell onto the rocks, since then the colour of the rocks has changed to creamy white. Many piligrims visit this beautiful place and pray for miracles and return home with smiles on their faces as our lady answers their prayers. Never forget that miracles happen to people with faith, and your faith in Jesus can move mountains. What to see in the Church of the Milk Grotto? You will see soft white rock, many believe if the will take the soft white chalk and mixed with their food, and praying to our lady of the milk it will increase the amout of their milk or enable them become pregnant. When is the best time to visit the Milk Grotto Church? 3. 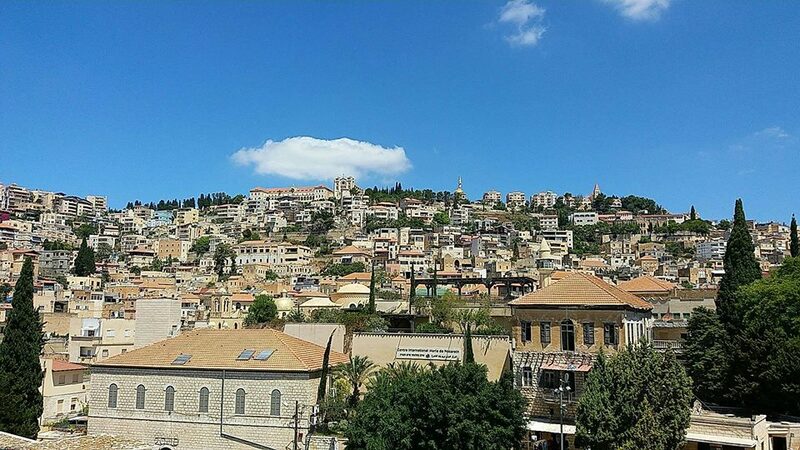 Beit Sahour is the Christian village that leads to bethlehem and the "Shepherds' Fields". There are two churches at the same site, one is run through the Greek Orthodox and the other by the Franciscans. What to see in the Shepherds' Church Fields? You will see two beautiful Churches, Greek Orthodox and Roman Catholics(Franciscans) which both identify as the Shepherds' Fields. When is the best time to visit Beit Sahour? is located in the ancient city of Jerusalem. This is the most holy Christian Church in the world. The Church of the Resurrection (Sepulchre) has been an important pilgrimage destination since the 384 AD. Mark 15:22 They brought Jesus to the place called Golgotha (which means "the place of the skull"). What to see at the Church of the Holy Sepulchre? Inside the entrance to the church is the Tomb of Jesus, which tradition believes to be the spot where Jesus body prepared for burial by Joseph of Arimathea. Outside in the back of the courtyard as you face to your left of the entrance, there are 11th century Greek Orthodox chapels built by Constantine Baptistery over the site. Autumn is great as well in October, November and December during Christmas season when temperatures are on average 15's-22's which is perfect for travel. 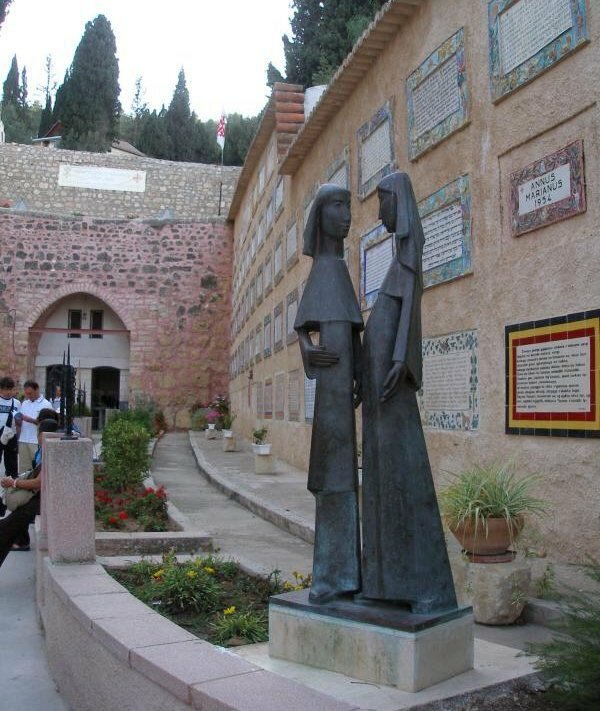 When you arrive to St. John Church in Ein Karem, just walk 5 minutes and you will see the beautiful Church from there. 6. Church of the Annunciation, is one of the most beautiful and biggest churches in the middle East located in the city of Nazareth. The site is a famous pilgrimage destination and hasbecome one of the most important stops for Christianpilgrims in the holy land. Inside the lower church of the annunciation you will find the cave where our Mother Mary received the news from the Angel Gabriel. In the upper church you will find many icons of our Mother Mary from all over the world and hasSunday mass at 10 am. Luke1:26 now in the sixth month the angel Gabriel was sent from God to a city in Galilee called Nazareth. 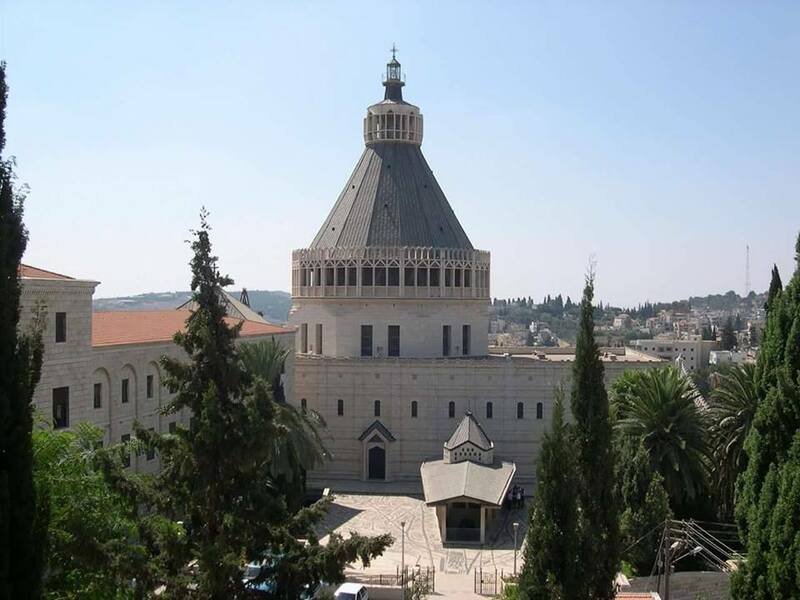 What to see at the Church of the Annunciation? Here you will see the spot (first floor) where the Angel Gabriel told Mother Mary she would become the Mother of the Son of God. You can easily get there by car and enter the city. The best day is Sunday as there is no traffic in the city. Most Israeli cities are connected to Nazareth by bus. For example you have bus from Haifa 331, Tel Aviv 823, 826,and bus 955 from Jerusalem. When is the best time to visit Church of the Annunciation? Autumn is good in (October, November and even in December) during Christmas season when temperatures are on average 15's-22's which is perfect for travel. Today, this beautiful monastery is run by the Carmelite Franciscans who live there. 1 Kings 18 Later on, in the third year of the drought, the Lord said to Elijah, “Go and present yourself to King Ahab. Tell him that I will soon send rain!” 2 So Elijah went to appear before Ahab. When is the best time to visit Saint Elijah church of Mount Carmel? Autumn is also a good time in (October, November and even in December) during Christmas season when temperatures are on average 15's-22's which is perfect for travel. 8. Cana Village is located in the galilee just 10 km from Nazareth. 9. Church of the Beatitudes is located at the Sea of Galilee near Tabgha. The Mount of Beatitudes is very famous in the bible for being the place where Jesus made the miracle with the Loaves and fishes. After you finish your trip to the church of the beatitudesyou can walk and visit Saint Peter church just 500 metersaway. What to see at the Church of the Beatitudes? You can see the Catholic Church in the mount of Beatitudes and the mountain where Jesus made his sermon and miracle with the loaves and fishes. The area is so beautiful, quiet and full of gardens. The Sea of Galilee is just 50 meters away from the church. Driving by car is the best way but taking a bus touris a wonderful way to enjoy the beautiful scenery along the way. When is the best time to visit the Mount of Beatitudes? or additional information about the 1o churches i mention.